Well-written and heavily referenced crap. Nearly every other sentence is referenced, but the references often do not support the claims being made. A prime example of pushing an excessively anti-alcohol and anti-drug message by making statements that are obviously false. The authors also consistently confuse correlation with causation. Pathetic. This comprehensive and accessible book documents the physical and emotional effects of substance abuse in girls and women, explores the role of the advertising and entertainment industries in popularizing various substances of abuse, and discusses the way America responds to this enormous health problem. Covering a broad range of substances--nicotine, alcohol, prescription and illicit drugs--the book addresses the unique reasons that girls and women smoke and abuse alcohol and drugs. It provides the most current information about the use of prescription and club drugs, key warning signs of addiction, and options for prevention and treatment. The book includes historical anecdotes and testimonies from recovering women. 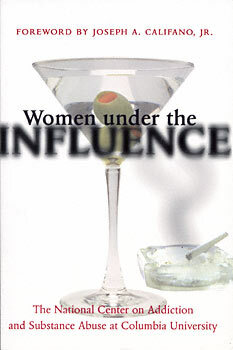 Incorporating more than a decade of extensive research, Women under the Influence will help women, health care prefessionals, educators, and policy makers understand the scope of substance abuse in girls and women, the urgency of responding to the problem, the key points of intervention, and potential roads to recovery. "You know you have a problem long before you seek a solution to it. You think you can master it yourself, you think you can stave it off with either abstinence or strong will or, quite frankly, pacts with God...I was incredibly secretive, very proud, very much in denial...I didn't really understand what it was going to take to beat my addiction...I kept thinking I could strong arm it, abstain for a period of time." "I did the patch. I smoked on the patch. I did hypnosis. I tried everything until that morning it felt like an elephant was sitting on my chest. And I said, 'Here's the deal: You're alive so you can make decisions. You can decide to smoke and continue to feel this way, or you could not.'" "Alcoholism is a slow, insidious, difficult, and progressive problem...I'm really happy that my family and friends intervened because I was personally miserable during the time that I was drinking." The National Center on Addiction and Substance Abuse at Columbia University was founded in 1992 by Joseph A. Califano, Jr. who served as President Lyndon Johnson's chief assistant for domestic affairs and as Secretary of Health, Education, and Welfare under President Jimmy Carter. The center is a research and policy organization dedicated to combating substance abuse, bringing together the professional disciplines necessary to study and combat abuse of all substances--alcohol, tobacco, and illegal, prescription, and performance-enhancing drugs--in all sectors of society.